Lock, Model CC2500, in line stainless steel checkweigher. Rated from 10 to 90 products per minute – depending on materials and application. Equipped with a (4) chain 10" long x 9" wide in feed, 16" long x 9" wide load cell and 10" long x 9" wide discharge conveyors, 12" wide x 12" long flex link reject conveyor with single head ram arm reject. Weight range from 10 to 3,000 grams with accuracies ± 2 grams depending on product, container and enviorment being run in. Control Panel has touch pad operator interface with readout and start, reset and e-stop push button controls. Mounted on stainless steel base frame with casters. Lock, Model Insight 3F/HF HDE, automatic, in line, stainless steel, three frequency, metal detector with number of product per minute – depending on materials and application. Working Aperture: 10½" in Height; 6" in Width. Equipped with 4" wide x 60" long white flex link product conveyor with push arm reject, variable speed. Sensitivities: depending on product, container and enviorment being run in. Touch pad controls with display. Mounted on (4) leg base frame. Lock, Model Insight 3F/HF HDE, automatic, in line, stainless steel, three frequency, metal detector with number of product per minute – depending on materials and application. Working Aperture: 10½" in Height; 6" in Width. Equipped with 4" wide x 60" long white flex link product conveyor with push arm reject. Sensitivities: depending on product, container and enviorment being run in. variable speed and touch pad controls with display.Mounted on (4) leg base frame. 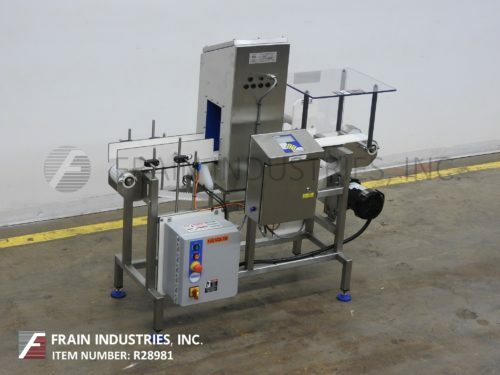 Lock Model CK2500, in line stainless steel checkweigher rated to 50 meters or 165 feet per minute with number of product – depending on materials and application. 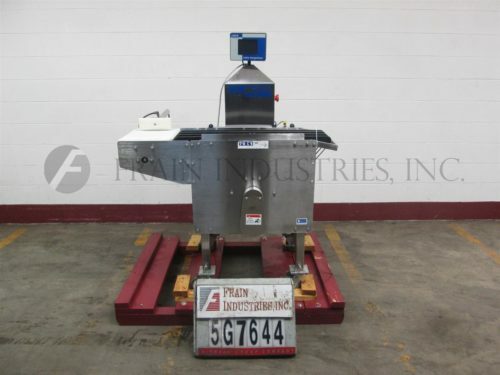 Equipped with 12" long x 8" wide in feed, 13-3/4" long x 8" wide load cell and 16" long x 8" wide discharge neopreme belt conveyors, with 34" in feed and discharge heights. Rated from 25 to 2500 grams with accuracies + / – 1 to 2 grams depending on product, container and enviorment being run in with single head ram arm reject. Control Panel has touch pad operator interface with readout and start, reset and e-stop push button controls. Mounted on height adjustable base frame. Lock, Model Insight, stainless steel, automatic conveyor thru, metal detector with number of product per hour – depending on materials and application. Total Aperture: 3¼" in Height x 7¾" in Width. Sensitivity rating: 1.5mm Ferrous; 1.5mm Non-Ferrous; 2.0mm Stainless Steel depending on materials, application and environment being run in. Equipped with 74" long x 6" wide Intralox style conveyor and air blast reject with collection bin. Control panel with touch pad display and statis light bar. Mounted on a stainless steel frame with leveling pads. Lock, Model MET 30+, metal detector head. Total Aperture: 3½" in Height; 43½" in Width. Control panel has touchpad controller with visual display. Lock Model Insight, IP3FHF, automatic, stainless steel, (3) frequency metal detector rated from 20 to 60 feet per minute with number of product – depending on materials and application. Total Aperture: 8" in Height; 6 1/4" useable above the belt; 13-1/2" in Width. With Equipped with 12" wide x 60" long white flex link product conveyor and ram reject system with pusher plate. Sensitivities: depending on product, container and enviorment being run in. Control panel has touch pad controller with readout display and is programable from 1 to 200 different presets and is mounted on a stainless steel frame with leveling legs.